Owing to the rich industrial experience and expertise in this business, we are involved in providing Articulated Jib Crane. Our Articulating Cranes are extremely versatile and can easily be mounted on a pick up truck, flatbed, boat, ambulance, yacht, etc. We offer provide our customers a customization facility to meet their requirement. These are folding kind of cranes that are manufactured in sections, which can fold at every section that simply works like a human arm. We are offering Electric Articulated Boom Lift to our clients. We come forward to present the excellent quality Column Mounted Articulated Jib Crane, industrial jib cranes, hydraulic jib cranes which are mainly used for the industrial purposes. With the assistance of our efficient workforce, we are offering a wide range of articula. This product is developed by our professionals using best quality material at our well-equipped manufacturing unit. Furthermore, clients can avail this articula from us in standard as well as custom-made forms. SPANCO Articulating Jib Cranes are designed using a 15% factor for weight of hoist unit and a 50% impact factor. 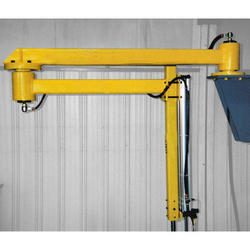 All SPANCO Articulating Jib Cranes are designed for moderate usage. Consult factory for usage other than moderate and all instances of high cycle rates or high impact applications such as high-speed air or electric hoists, vacuum lifters, or magnets.